The 31.75 metre motor yacht Serendipity, listed for sale by Daniel Memper at Memper Yacht International in Monaco, has been sold to a direct client. With exterior styling by Stefano Righini, Serendipity was built in GRP by Italian yard Benetti and delivered in 2012 as one of the yard’s popular 105’ Tradition series. A contemporary interior by SFL Design in cherry wood paneling accommodates 10 guests in five cabins consisting of a main deck master suite, two double VIP suites and two twins, all with entertainment centres and en suite bathroom facilities. In addition, there are quarters for five crew in three cabins. The capacious saloon has panoramic windows and a large settee and armchairs to port facing an entertainment centre to starboard including a large flat screen television and a stereo surround sound system. Further forward is a full wet bar and a formal dining area with seating for eight guests. The aft deck is particularly geared for al fresco entertaining and dining, featuring two large tables, occasional chairs and built in upholstered bench seating. The sun deck is entirely dedicated to sun worshippers, offering a host of sun pads and loungers as well as a spa pool to cool off between spells in the sun. For those with more tender complexions, the builder has added a custom hard top, offering welcome shade for comfortable relaxation with a long, cool drink. 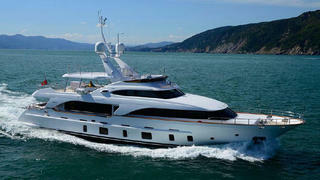 Twin 1,000hp Caterpillar diesel engines give her a cruising speed of 14 knots.